Sire line: Mirage d.b. 1919 Anazeh Sebaa | Dam line: Rodania d.b. imp. 1881 to Crabbet Park). He is by the well known RFI Maktub (Altam Yshmayl x RFI Cyntillation) out of the mare RFI Fayara El Shiraz (Shiraz El Jamaal by Ali Jamal) x Fire Glory). and WINNER OF THE BEST MOMENT OF 2016 !! 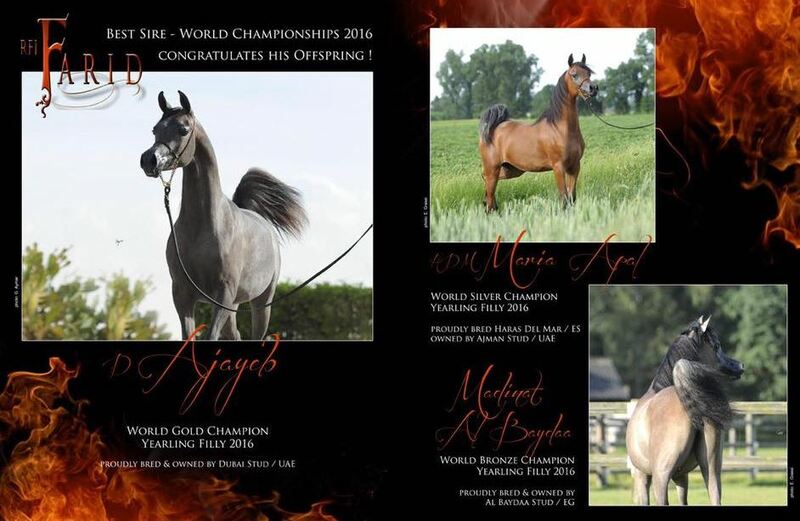 Himself an International Champion RFI FARID was the sire of World Yearling Gold Champion Filly D Ajayeb, Silver Champion HDM Maria Apal and Bronze Champion Madinat Al Baydaa, an extraordinary achievement and an approval of his ability as a sire, especially considering that all three fillies were out of ompletely different mares. This achievement made him the Leading Sire of the Paris-Show, a title that Marwan Al Shaqab has claimed for the last decade. Our grateful thanks go to Raphael Curti, the whole Privilege Team and the “RFI Farid partnership” who allows us to breed with RFI Farid to one of our best mares: Khaliq Nayla. We know RFI Farid since his debut in 2010 on European soil at the Kauberplatte B-Show which he easily won as GoldChampion and Frank Spoenle on the lead. Since then we followed his career and we are now super happy to incorporate him in our breeding program. 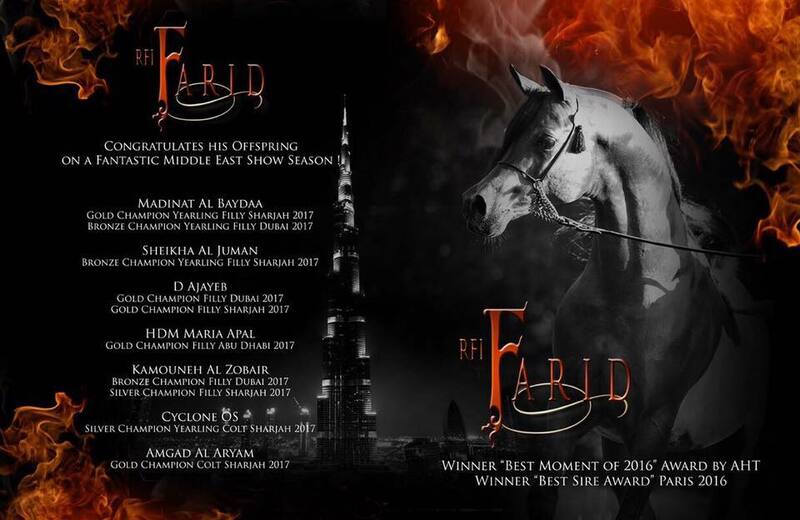 RFI Farid boasts the most gorgeous blend of many breed greats – having just the right amount of good Polish breeding behind him coupled with a Bey Shah sire line and two close-crosses to the legendary sire Ali Jamaal. The results, in fillies, during the Salon du Cheval of last year, sealed the deal on Farid showing the world just what he is capable of. His message, loud and clear, is that he is capable of producing True Greatness, a quality to covet in a sire. However, it is the German photographer Gregor Aymar here, that exposes his true greatness, behind the lens, in this exquisite photograph of a young sire setting the world on fire. Remember it was Gregor who also gave us the near-perfect pictures of QR Marc in the sand and of Lutfina AA with Raphael and the herd of cows.